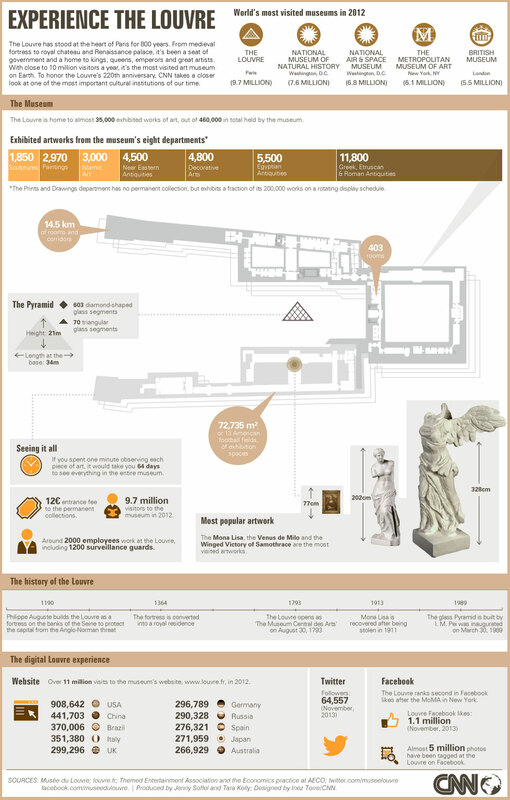 This infographic is part of CNN's "Inside the Louvre," series where we gained unprecedented access to the world's most visited museum. From the handler who looks after the Mona Lisa's famous smile, to the new director, we meet the people at the heart of this renowned institution. Watch the 30-minute special show from Dec 2-4. Can art save this mining town? Henri Wosniak had only ever seen France's beloved painting -- "Liberty Leading the People" -- on postage stamps. Then the real thing turned up on his doorstep. As part of CNN's special series "Inside the Louvre," we asked you to share your favorite artwork via the hashtag #LouvreFavorite. For four hours every day, 65-year-old Sigrid Avrillier is transformed into the legendary Renaissance painter, Peter Paul Rubens. CNN's Nick Glass looks at the tradition of copying great works of art at the Louvre Museum in Paris. It's the height of summer in Paris, and the director of the most famous art museum in the world is queuing like any other tourist. CNN's Nick Glass explores whether or not Leonardo da Vinci's famous painting should be cleaned. The Louvre is the most visited art museum in the world. CNN takes a closer look at one of the most important cultural institutions of our time. CNN host Nick Glass takes a backstage tour of the Louvre looking at the maintenance and upkeep necessary at the world famous museum. What's your favorite Louvre artwork? The Louvre is home to some 35,000 pieces of art. Now we want to know what's your favorite work of art. Tell CNN your #LouvreFavorite. A daring burglary over 100 years ago tells the story of how the Mona Lisa was catapulted to international stardom.